Keep your drinks cold with the Stacking Ice Cube Tray. It is designed to channel water so the trays fill quickly and evenly. Multiple ice cube trays also stack neatly on top of the Ice Cube Bin to save space in the freezer while storing larger quantities of ice. The shape allows ice cubes to release with an easy twist. Other than water, this ice cube tray can be filled with other drinks, fruits, herbs and more to add a little flavor to your beverage. Sixteen, well-sized ice cubes form in each tray to ensure there is enough for many drinks at once. It is dishwasher safe, as well as BPA-free and phthalate-free. 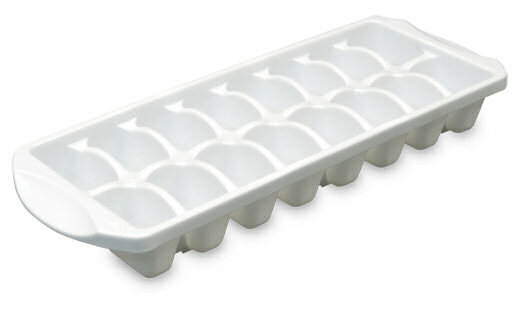 The overall dimensions of this item are 13 1/8" L x 4 7/8" W x 1 5/8" H.
Overall Assembled Size: 13 1/8" x 4 7/8" x 1 5/8"
Stacking Ice Cube Tray is rated 2.8 out of 5 by 9. Rated 1 out of 5 by Vaderman from Will Sterilite stand behind their product? I first bought these ice cube trays from Amazon. They came in a 12 pack and sold by Sterilite and were a really great price. After 6 months one by one they developed cracks in the end cavities, with each tray eventually having 4-6 broken cavities and dripping water with every use. $18.00 wasted as they are all unusable. Thinking the reason that they were such a great price was possibly they were 'production seconds' and therefore lesser quality. I decided to buy new ones at a local retailer. Again within 6 months of use the 2 pack of trays have developed cracks and are leaking all over my freezer. $5.00 wasted as they are both unusable. 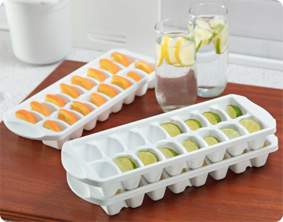 The design of these ice cube tray is very good, they are easy to fill and stack perfectly. That is the only good part. I have wasted $23.00 before tax. I am very disappointed with the durability and wondering if Sterilite will stand behind their brand and do anything. That will be my determining factor if I ever purchase a Sterilite product again. Rated 1 out of 5 by JC from what good is an ice cube tray with cracks? These don't hold up at all. Ice doesn't want to come out. After a few months I see they are cracked, water leaks right out. Rated 1 out of 5 by cubes from ice cube trays are junk! I have gone through 4-5 sets of the ice cube trays in 2 yrs. They crack and drain water all over the freezer. But the thing is, that is all you can buy at any stores and they are JUNK! What does the consumer have to do in today's age to get a quality product that is dependable at a decent price! I am at wits end about buying anymore ice cube trays and just buy ice at the local store! Rated 5 out of 5 by UpstateKate from Fantastic Ice Cube Tray These ice cube trays are heavy duty and produce large cubes. These trays will last for years. I've replace all of my old trays with these trays. Rated 1 out of 5 by Ken T from This product cracks under the bottom of the trays I have returned three and have three that I cannot return since I no longer have the receipts! DO NOT BOTHER BUYING this product! the only good thing about them is that they stack well! Rated 1 out of 5 by nytoaz from not so good... I purchased four of these ice trays and to date all four have cracked on the end cups. I also have another well known brand that was purchased as a replacement of one of the sterilite trays and it has not cracked. So, I obviously have to replace all three others with the other brand. Its too bad, this is the first time I've ever had a problem with a sterilite product. And, these are the best quality of all of their ice trays. Rated 5 out of 5 by Shirley from I love this product! 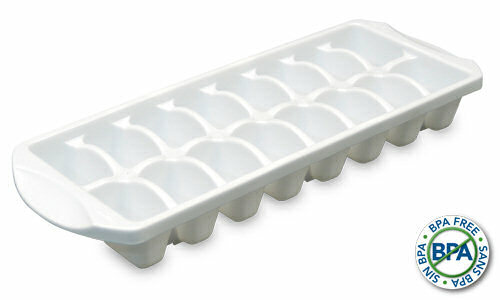 I just bought one Sterilite ice tray at Ace Hardware, and I love it! It releases the ice with just a small twist and BPA free. Wonderful! I am going to buy another one this afternoon. Rated 5 out of 5 by Shane from What a difference... In our home right now, we have two types of ice cube trays: This model, and also the blue Sterilite plastic trays. (Model 7430). This tray is VASTLY superior. The cubes do not stick. The material is durable. Very easy to get the cubes out of the tray. Big, full cubes, with no sharding. Going to buy more of these and throw away the broken, shoddy blue trays.